Universal Studios Hollywood, here we go! 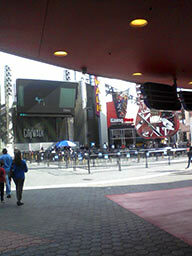 After the parking lot at Jurassic Parking, we headed straight to the retail district that is known as Universal CityWalk Hollywood. The place is expensive but a real sight to look at. It gives you this welcome feeling and the taste of an adventure that is about to begin. 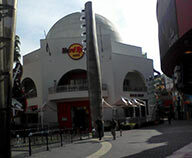 Though I don’t buy anything at CityWalk, I enjoy walking through there right before arriving at Universal Studios Hollywood theme park! 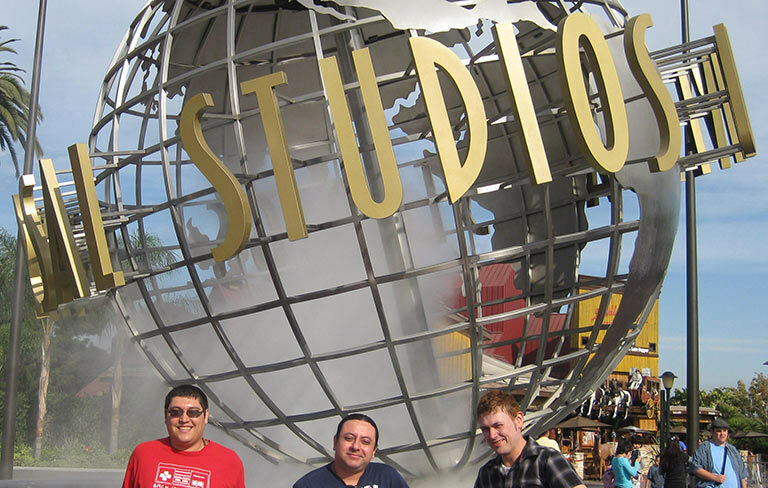 Thanks to a nice Asian tourist, a photo of us three was taken right before entering the theme park. Right after showing our online tickets to go inside, some of the actors for the Water World play were greeting everyone and announcing that they were about to start their show in a few minutes. 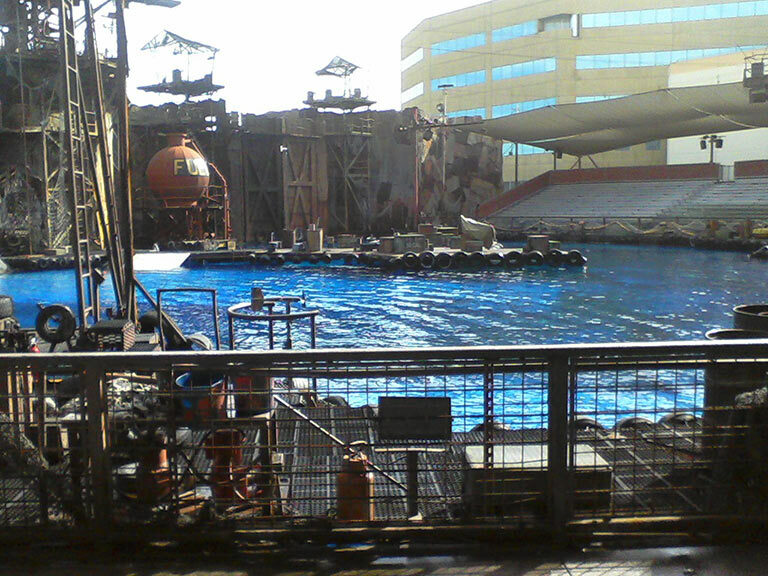 The location was really close by, so we agreed to watch the play as our first attraction in the amusement park. 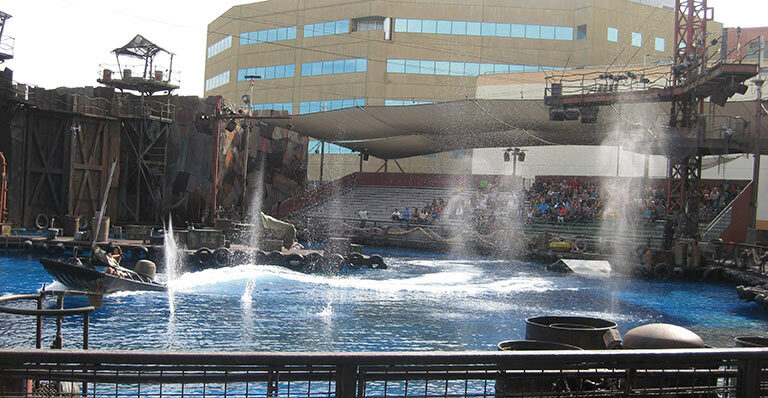 As I�ve always remembered from previous visits at Universal Studios Hollywood’s Water World play, the actors do a great job on this live-action play. 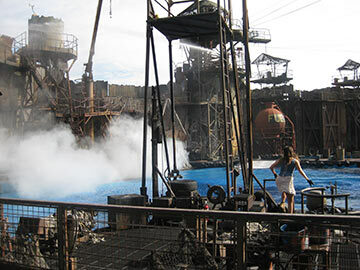 There are amazing stunts, yelling, fire, explosions, and a lot of water involved. Since we were sitting on a soak zone, I was afraid of having my friend’s digital camera (and my cell phone) wet, so I had to protect them somehow. I used Glenn�s cap to wrap my cell phone and put it inside my right pocket in my shorts. As for the camera, I just had to risk it since I wanted to take photo shots with it. Luckily, I was very protective of it and nothing bad happened. 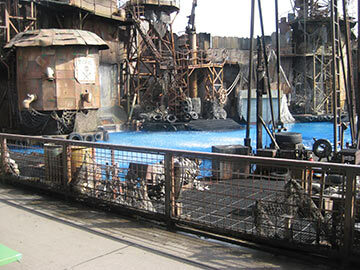 These actors at Water World have also appeared on T.V., by the way. I don’t watch T.V. at home, so I didn’t recognize any of them. When the play was done, the actor that was playing the antagonist introduced the whole cast and who they have played as on famous T.V. shows and movies. I only remember one being from one of the Resident Evil movies. Right after Water World, we headed straight to The Simpsons Ride. 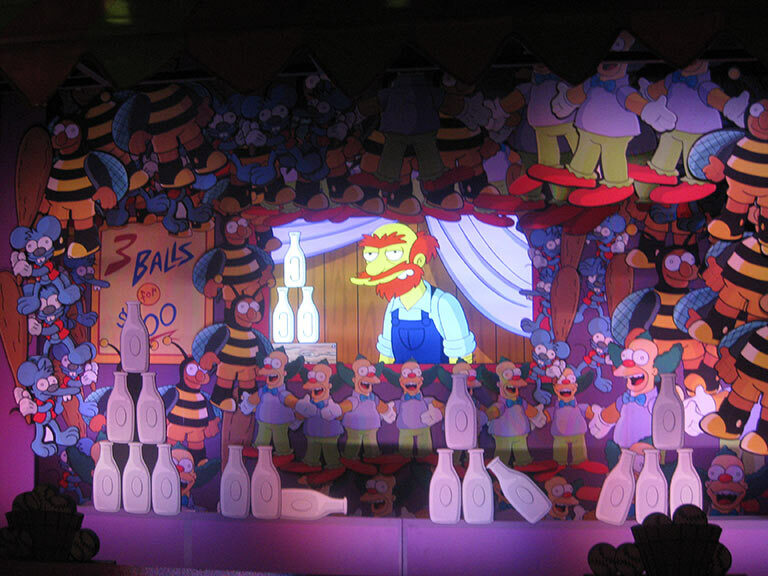 I was pretty saddened for the fact that the Back to the Future Ride was replaced by this cartoon theme, but all in all, it was still a fun ride. I used to watch The Simpsons when I was a kid, so it brought back some nostalgia as well � especially on the part where the famous intro theme starts playing and sort of makes you part of it. It really was a fun 3D ride but I’m really going to miss the original. Oh, and I wasn’t able to take photo shots since cameras are not allowed inside the ride. I took that photo of Groundskeeper Willie before I saw a sign prohibiting said devices. 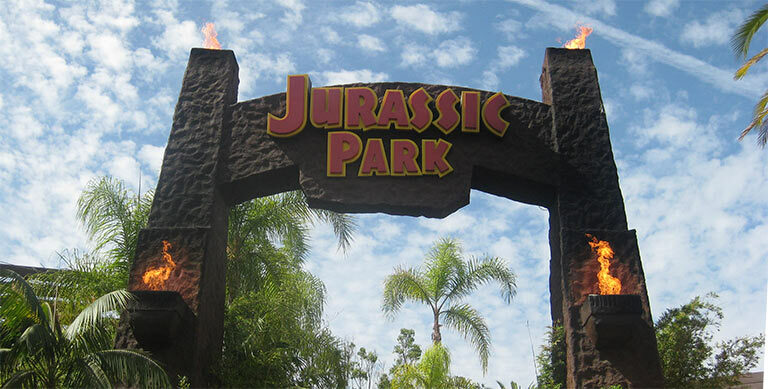 After the adventures with Homer and his family, we headed straight to Jurassic Park: The Ride. I really love this one! 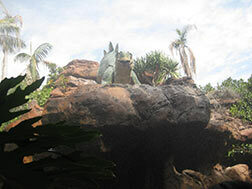 It�s a peaceful and relaxing ride on a raft with animatronic dinosaurs eating endlessly around you. 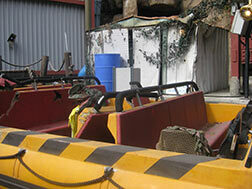 You get little drops of water and squirts here and there but nothing really serious…until the end of the ride, that is! Where the raft ascends uphill a few feet high and then WHOOSH! 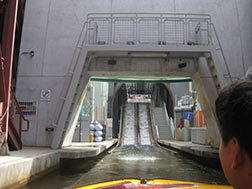 The raft falls down from a waterfall at great speed with a water collision that splashes everyone good. Real good. It’s a short ride but nonetheless awesome. Since Revenge of the Mummy: The Ride was close by, that became our next destination. 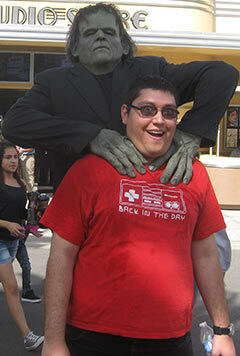 And right between the two rides, Gab saw Frankenstein’s monster, so he requested a photo shot with him. His face was priceless.